I find it fascinating to watch how iPods have proliferated—not just as far as how many people I see with them on the street, in the gym, on planes—but also as far as how many related products they have produced. Users can buy iPod-ready alarm clocks, stereos, car radio adapters, speakers, and a lot more. Heck, pick up any copy of the SkyMall catalog, and you'll probably come across four or five different options. Our industry, following the trends of what consumers want, has intelligently found options for hotel rooms. 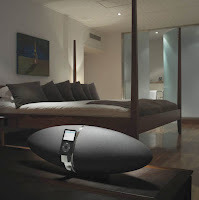 The latest variation that I've seen is the Zeppelin B&W, a high-end speaker system for the iPod. B&W is known for having their products everywhere from the famed Abbey Road studios in London to the Jaguar XF automobile. I haven't actually heard sound through the Zeppelin yet, but what I really like about it is the design ... the sleek, sculptural form is certainly an attention-getter. We've gone back and forth through periods where we wanted to hide speakers and where we wanted to make them stylish accessories. Maybe we're moving into an era of the latter type; the Zeppelin is certainly something that I'd be impressed to see on my hotel room's desk. I also find it facinating, the way little things can become such a nessecity in life. What did we do before items like blackberries, ipods, etc. I think the Zepplin is great looking...but I want to throw out something that I find a very interesting way to "hide" those speakers, as I think it could really be useful in hotel rooms, where countertop space is always at a premium. check out the brilliant audio lamp...I find this to be such an interesting use of the base of a lamp...for hotel usage. just some other food for thought. Interesting link, thanks so much for the comment. As social networking over the web increases, we are going to start seeing more and more devices like the IPhone catch on in the main stream so support for these will also be important in the hospitality industry. I don't know what is out there right now, but I would expect to see some sort of device that will support all my gadgets like the IPhone in the near future.